Was a very enjoyable game of rugby that. @physichull - AFAIK Sammut is on a two-match penalty notice for making contact with the ref in their pre-season friendly against Salford. News that Ben Barba has been sacked before his first game. Rumours surrounding an assault. Unbeliev....oh actually, yeah, not surprising! Cas....Wire...interested? Depends on affordability and also Visa issues I guess if its as bad as it sounds....you don't get sacked immediately for just a minor blip. 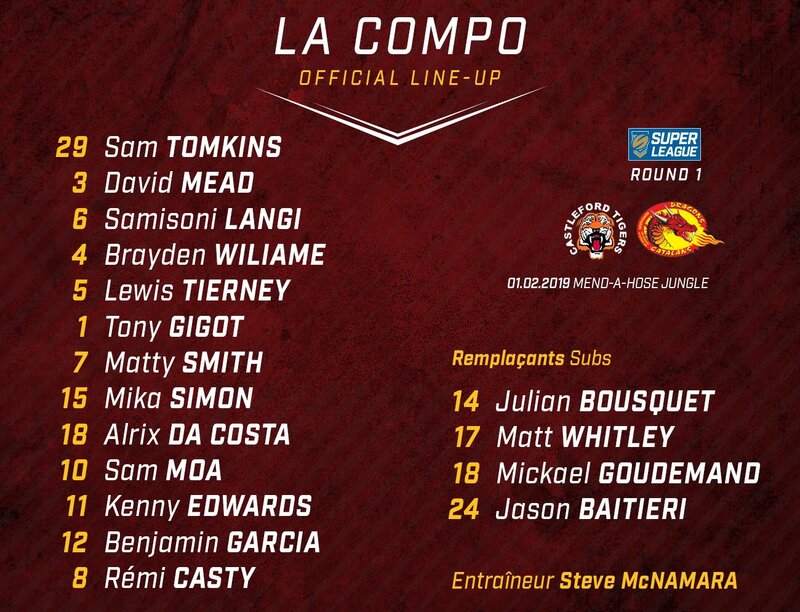 Shame about Sammut. I guess I'll see him turn it on when Rovers play Wigan and I'll end up thoroughly demoralised! In other news, Luke "of course I won't rename Widnes Vikings to Liverpool Vikings" Backhouse and Koukash, the two who were originally looking to buy Widnes, are now relaunching Liverpool RLFC. Will be interesting to see how that goes. I feel sick. Derby nerves. Hate the derby. Vorsprung durch get in!!!!!!! Keinhorst!!!!!! Linnett, Greenwood and Garbutt were immense. Linnett in particular was a tackling machine. A defensive masterclass from him. arrrghhhh my head.....damn you beer. Did ya overdo it a bit last night? Didn't over-do it, it was just the required amount to stop my hands shaking! Haha! Looking forwards to tonight's game. 3 great TV games. Shot clocks doing their job and keeping things ticking along nicely. Fair result on Thursday. Sts looked a bit sharper and caught Wigan cold in the first 15 minutes. The Sammut ban came from two players having a bit too much to say to each other and the ref stepped between them. Sammut moved forward and touched the ref. No drama, but the bar is set for the rest of the season with that one. London was a bit of a shock. Looks like no easy ride down there any more. Disappointed by the Warrington Leeds game in that it was such a one sided contest. Leeds just couldn't get near for much of the game and never looked like scoring. Not incredibly impressed by Hurrell though. But like you said, he'll put in a man of steel performance against Rovers now I've said that. York gave Toronto a decent game today but sadly were kept to nil. "Maybe we are not as good a team as everyone is tipping us to be." Hardly inspiring stuff Chris, not sure that's the message of confidence that your players clearly need. There are no easy games. The Middle 8s over the last few years have proved this. Teams like Toronto, London, Halifax, Toulouse etc can all capably put in decent performances to trip up a SL club. Which SL club will Ben Barba end up at? Wigan have Hardaker so can hardly take the moral high ground here, but somebody will pick him up. I don't think he'll end up at any club after having read more into it. And rightly so, if all the rumour is true. The door seems firmly closed on that one. And rightly so. Absolutely. I think this would send an awful message if a SL club came in for him. 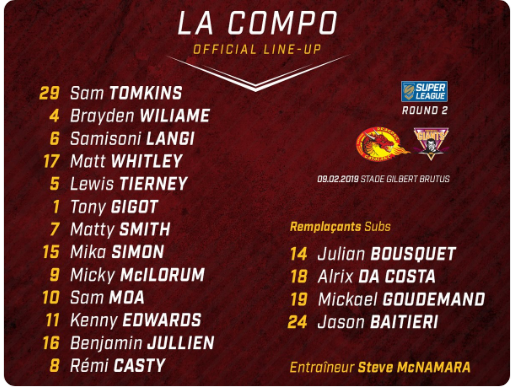 The question as always is where do you draw the line with characters like this...Hardaker, Tomkins (J), Chase, Adam AND Jonathan Walker, Cockayne....I could go on and on. More good TV games coming up. Going to Rovers v Wire on Saturday. Trepidation. Thats right. That's what the Wire fans should be feeling right now! Briefly going off the Super League topic - this Toulouse-Widnes match in the Championship is a belter. 18-16 at half time. Looking forward to Catalans-Huddersfield later. My ma & pa are currently in Dragons country, so they should be in the bar with les Villelongaises watching it. I expect I'll be getting reactions over WhatsApp! Our line-up for later on. Good recovery by us after a poor bit of defending let them in early on. 12-6 as I type this. Casty off, concussion protocol. Baitieri on to replace him. We do keep getting players clobbered like this.